If you want to see levelheaded intelligent people lose their cool, ask them what they think of the Oxford comma (aka the serial comma). Whether it should or shouldn’t be used is a hotly debated topic that’ll never see one side win. I’ve witnessed shouting matches, read cruel words online and on social media in defense of or against the serial comma. It seems everyone has an opinion on it. You either love it or hate it. Then there are others, like me, who can go either way. I’ve had to use it or drop it depending on my clients’ preferences and I’ve lost zero sleep at night over it. Are you ready for the truth? There’s no set rule that the serial comma is mandatory. It’s purely a style decision, and using it can change as often as you change your shoes. If you want fewer headaches for yourself, then you’ll learn not to take the presence or absence of the serial comma personally. 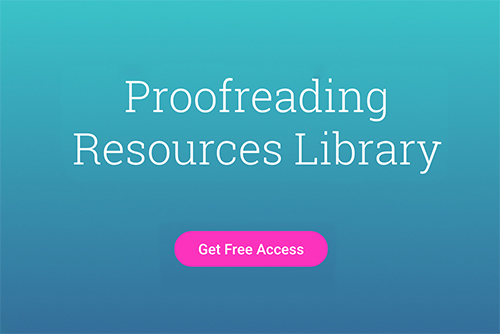 If you want more proofreading tips, check out our free proofreaders’ resource library by clicking here! What Is The Oxford/Serial Comma? The Oxford comma earned its name because it was first used by Oxford University Press. It’s commonly used in the Unites States, whereas countries such as Canada, the UK and Australia don’t use it. In Canada we prefer to call it the serial comma. I went to the store and got eggs, milk, butter, and bread. Defendants of the serial comma believe that it adds clarity. I went to the store and got eggs, milk, butter and bread. Those against the serial comma say it’s redundant to use a comma when you have and there. Whoa, what just happened there? What does the sentence mean, for the love of God? Does it mean the writer’s parents are Ayn Rand and God? Or are they thanking three separate entities? Anti-serial comma folks say it’s obvious the person’s parents aren’t Ayn Rand and God. Because, really, that’s just not possible. The pro side argues that without the serial comma, the writer indicates that their parents are Ayn Rand and God. Therefore, the serial comma is needed to show that beyond a shadow of doubt the writer doesn’t think their parents are Ayn Rand and God (at least we hope not). So you can see how an argument can be made for or against the serial comma. But do you see how it all comes down to clarity and preference? You either decide to use it or you don’t. And like the video says, there are bigger problems in the world. I prefer not to use the serial comma for my own writing because I just don’t consider it to be necessary. Canadians aren’t taught to use the serial comma, and many editors I’ve worked with despise it, so it’s fair to say I’ve been influenced. People can argue both sides till they’re blue in the face but in the end the only rule that applies is consistency. As long as you’re consistent in using or not using the serial comma, then you’re fine. Follow the client’s style guide if they have one. If they don’t address it, make sure you ask what they prefer because even the most laid-back person has an opinion on it. Do you prefer to use the serial comma or not? Or are you ZFG about it? I go back and forth between using it. Probably because I have clients who want it and those who don’t. I grew up in Canada, too, and it’s pretty much an even split, I find.